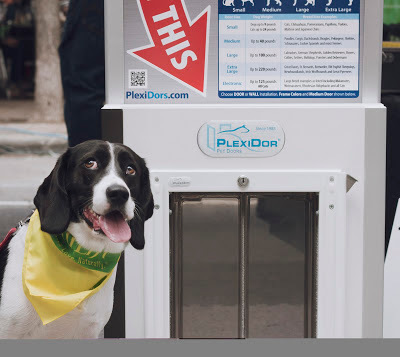 PlexiDor Pet Doors visited Woofstock in Toronto last weekend. This is the largest outdoor festival for dogs in all of north America: the arrangers estimated 300,000 visitors of which many brought their furry friends. We'll have a bigger feature of it on the blog soon, but for now, take a look at Oreo. She came by the booth to check out the doors, and I think she liked them. Her eyes seem to say, "Can we get one of these?" Thank you to Jasmine Wang Photography for sharing the picture! "Mom, I like this door. Can we get one? Please?" Photo by Jasmine Wang Photography. Woof, sounds like I missed a pawsome event...again! MOM!!!! !